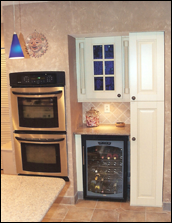 Cooking and entertaining is easy when you recruit kitchen remodeling by DWD Construction LLC in Bensalem, Pennsylvania. A team of licensed contracting specialists visits your home to evaluate your current kitchen and take its measurements. Once we get a feel for your personal design requests, we send this information to our kitchen authority and you receive an estimate. As soon as your design is exactly the way you want it, we create a list of suppliers and websites from which you may choose materials at your leisure. Select any color and style of cabinets you prefer. Most of our suppliers are local for your visiting convenience. Have us build on your original ideas, or let us design something amazing for you. Once we finalize these designs, we send the plans to our designers to have them perfected with your input. Ask us about supplying the blueprints to township local municipalities, should they require the information. Strictly code compliant, we pull permits for every project we undertake. Contact us today to update your home with affordable bathroom and kitchen remodeling.